Just when you think Greece has only taverna cuisine or continental cuisine or the latest sushi – you are wrong! If you are search of something authentic many Greek Taverna’s let you down. Serving thousands of tourists the tomatoes are mushy or unripe, the cheese from cow and passed as feta. In fact the Greek government has never taken a proper initiative to protect feta and so it is just another cheese commodity sold. Thalassaki located at the sea in Isternia Bay is all about re-thinking the Taverna cuisine and adding a dimension while respecting tradition. 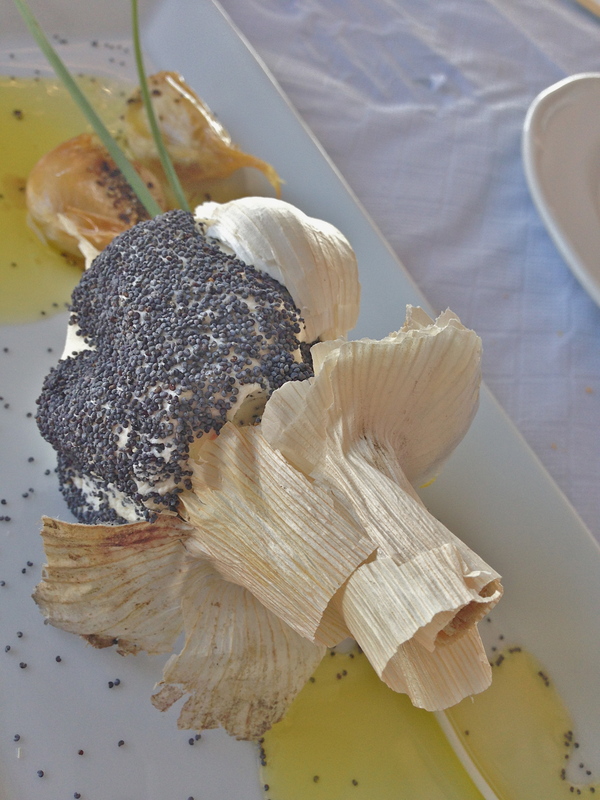 This dish is made to look like garlic but a closer look you’ll see it is local cheese topped with poppy seeds and roasted garlic and virgin olive oil and an accent of garden chives. Cleaver, playful and excellent.